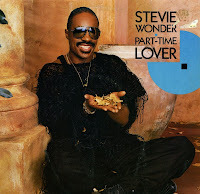 'Part-time lover' was released as a single in 1985 and was taken from Stevie Wonder's album 'In square circle'. The song reached number one in America, number three in the UK and number 11 in the Netherlands. The song featured R&B singer Luther Vandross humming at the end of Stevie's verses. I bought the 12" single mostly out of curiosity how the eight minute extended version would sound. The single was infectious enough, but the 12" single is a decent effort.